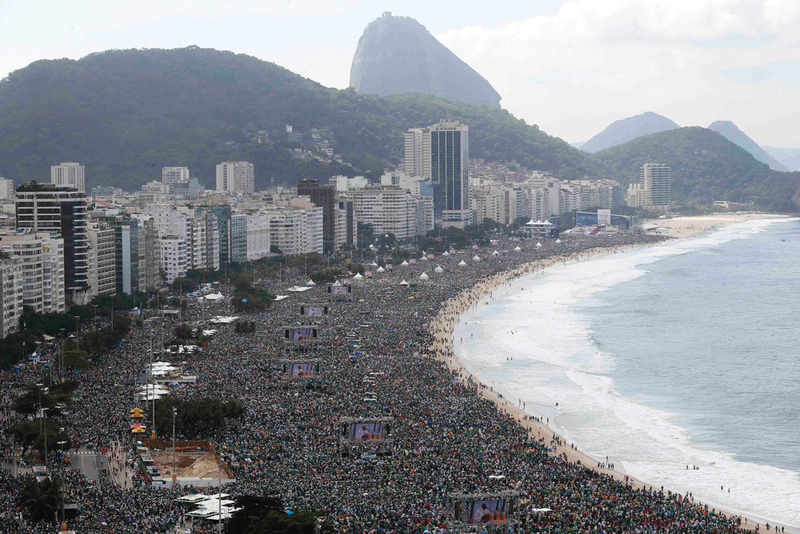 World Youth Day in Rio de Janeiro, Brazil, drew tens of thousands of young people from around the world. It was also attended by a senior citizen from Rome who managed to cause the greatest excitement on the streets of Rio and among the W.Y.D. participants themselves. After a somewhat chaotic arrival, his motorcade swarmed by enthusiastic pilgrims and residents, Pope Francis joined W.Y.D.-Rio on July 22, charming attendees and hosts alike with his characteristic humility, simplicity and joyful demeanor as he stopped his various motorcades, one conducted in a compact car, for impromptu embraces and blessings among the crowds. There were also opportunities for serious reflection. On July 23, the pope blessed a new drug rehabilitation facility. He said reducing drug addiction will not be achieved by a liberalization of drug laws, as is currently being proposed in various parts of Latin America, but through confronting the problems underlying drug use: promoting greater justice, educating young people in the values that build up life, accompanying them in their difficulties and giving them hope for the future. Pope Francis condemned the selfishness of what he called “dealers of death,” urging society as a whole to act with courage to stamp out the scourge of drug trafficking. Speaking directly to those who have fallen into “the darkness of dependency,” the pope said the church offers outstretched hands to help; but, he stressed, “No one is able to stand up in your place. Visiting one of Rio’s notorious favelas, or slums, Pope Francis spoke of the need to alleviate material suffering, but he also said that “real human development” requires the promotion of moral values, to satisfy a “deeper hunger, the hunger for a happiness that only God can satisfy.” The July 25 speech was the pope’s first major statement on social and economic questions during his visit to Brazil, a country that has enjoyed years of strong economic growth but is currently in turmoil over widespread dissatisfaction with government policies, high taxes and corruption. “The Brazilian people,” the pope said, “particularly the humblest among you, can offer the world a valuable lesson in solidarity, a word that is too often forgotten or silenced, because it is uncomfortable. I would like to make an appeal to those in possession of greater resources, to public authorities and to all people of good will who are working for social justice: never tire of working for a more just world, marked by greater solidarity. This article also appeared in print, under the headline "Pope Francis Calls for Solidarity and Dialogue," in the August 12-19, 2013 issue.